The new and improved Union Plus app gives you faster on-the-go access to all your favorites on the Union Plus website. Personalize your favorites with just one click. Add them faster from your home screen. Manage your profile and preferences, too. It's all easier than ever. What are you waiting for? Get the FREE app at unionplus.org/gomobile. Area 16 Special Olympics located in Desoto County, Mississippi, is an inspiration for all. Thanks to the volunteers and sponsors, these young people have a chance to shine. Mike Allen, business manager for Boiler Makers Local 263, approached the Memphis and West Tennessee Building and Construction Trades Council (MWTBCTC) with an idea to help this wonderful program. Soon after, the MWTBCTC donated the money for a new sound system that was desperately needed. We hope that this new sound system allows these Olympians to enjoy their games. We all should look to them for our inspiration. In a recent meeting with Shelby County Interim Mayor Joe Ford and Labor Union Representatives, Mayor Ford responded to a question from the crowd asking, "What can Labor do for you, for Shelby County?" It didn't take long for the Mayor to answer. It was obvious from the way he answered that it was something that truly bothered him. "Air conditioners. With limited funds and one death resulting from the heat this summer, we need air conditioners." 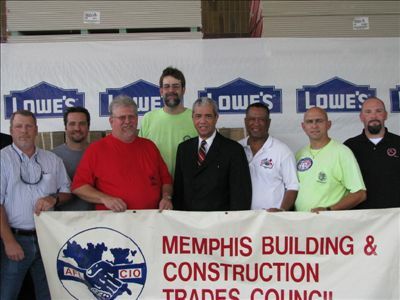 On Thursday, July 15, 2010, Mayor Joe Ford received an estimated $10,000 in air conditioners from the Memphis Building Trades Council, along with Lowes contribution of $2,500 as well to this worthy cause, which brought the total to $12,500 in air conditioners donated. The air conditioners were handed over to Shelby County Government officials during a press conference held at the Lowes store located at Perkins Rd. and Summer Ave.
A simple question asking how Labor organizations could help our County eventually took on a snowball affect and has so far resulted in not only $12,500 worth of air conditioners for our County, but also in the media joining the cause and challenging others to jump on board and reach a goal of $30,000 worth of air conditioners for those in need in our County. Members of our community reaching out to others with acts of kindness, such as those demonstrated here, prove how coming together and working together to help others affects our community in such a positive way.